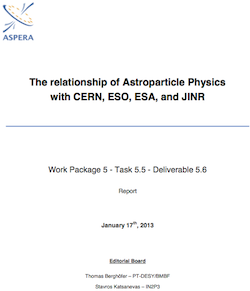 APPEC is seeking the contact to other major organizations funding Astroparticle Physics and policy makers and transnational institutions in this field. Please send email to the APPEC Contact Office if your institution (ministry, funding agency, or designated institution) is interested to join. 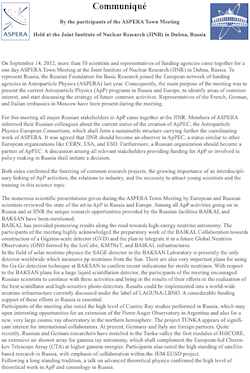 In order to intensify the relations between European and Russian Astroparticle Physics communities as described in the APPEC Dubna communique formulated after an APPEC meeting at the JINR transnational institute in 2012, a series of APPEC-Russia events has been launched. Go to the conference page and find the presentations of the “Lake Baikal Three Messenger Conference”. The TAIGA site visit in the news. In September 2017, a second conference was organized to cover Astroparticle Physics topics in deep underground laboratories such as the study of rare processes, neutrino physics, and direct dark matter searches. This event was related to the 50th anniversary of the Baksan Neutrino Observatory, the oldest deep underground laboratory in the world. Go to the conference page and find the presentations of the “Mount Elbrus Conference From Deep Underground up to the Sky”.